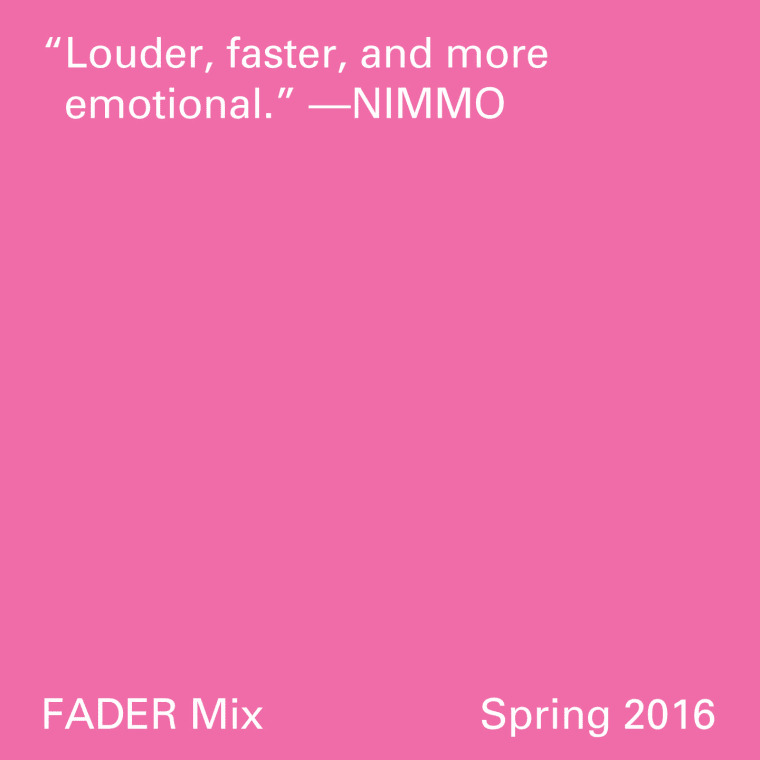 Nimmo is a five-piece electronic-leaning pop band fronted by childhood best friends Sarah Nimmo and Reva Gauntlett. Together, they make bittersweet, cathartic pop anthems that reverberate deep into the night, landing somewhere between a bright festival stage in the mid-afternoon and a heady, smoke-filled dancefloor at 2 a.m. Embracing their sunnier side, the north London band will take to The FADER stage at this year's Field Day on Saturday June 11, so to celebrate they've made us this summer-loving mix that glides through their dance-oriented influences past and present. Revisit their FADER interview for more on their troublemaking background, and keep reading for more from Sarah on what they've been up to lately. SARAH NIMMO: I am currently in my flat gathering myself back together after a weekend at Dot To Dot festival. This mix starts with Tourist's new track, "Run," which is the track I play most mornings at the moment with a tea on my balcony, and it ends with The Streets' "Weak Become Heroes," which is the track we usually see the sun come back up for at the end of the party. The mix is a little timeline of the moods that enter these kind of nights with our friends. How did growing up in London shape your approach to making music? This sounds cheesy, but it's taught us to follow our hearts. Growing up in London can sometimes be over-stimulating and pretty intense. We've always felt that our journey to where we are now is based on that primary hunger to feel and experience more, which definitely comes from living in such a fast-paced city. From the day we first picked up our guitars we wanted it louder, faster, and more emotional. Growing up in London is a rush. And it's that rush that we seek from our music every day. Touring! We're so excited to be out playing some of our new record. We will be releasing singles from it through the summer, through to the end of the year. What's the last book you read that had a big impact on you and why? Ive just finished reading The Fixer by Bernard Malamud. It's set in Russia around 1910. Some of the fear-mongering and anti-Semitism in the novel made me look at the world we live in now and sort of shudder at how much of that kind of hate is all around us today. Bit depressing, sorry! I'm amazing at making a beautiful dish called 'Petite Leftovers.' It takes massive skill. I aggressively yank open the fridge door around 1 a.m., throwing an arm to the back of the fridge and putting whatever I find into the microwave. Yeah, I can't cook. Eats Everything f. Green Velvet, "The Duster"
Danny Rampling vs. Mark Wilkinson, "Night & Day"
The Streets, "Weak Become Heroes"
Nimmo will play The FADER stage at this year's Field Day festival; get tickets here.